From paint stripper to nailpolish remover, household solvents are all too common throughout every home. A solvent is a substance that dissolves another substance forming a solution. Solvents that contain carbon are known as organic solvents and can contain chemicals considered hazardous -- they can be flammable and toxic. Some household maintenance and cleaning products contain organic solvents such as petroleum distillates. These are sometimes used to dissolve difficult stains or greases on certain materials that may be damaged by water-based cleaners. For site-wide search, jump to Search Box at page bottom. Organic solvents are used in household maintenance items as a carrier, thinner, and remover. However, wastesand leftovers can result in potentially hazardous household waste. For example, one cup of trichloroethylene, a solvent sometimes found in household cleaners or maintenance items, can contaminate about three million gallons of water. 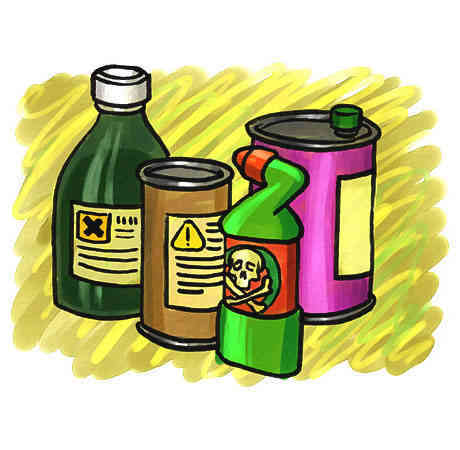 Organic solvents can produce the following environmental and health hazards when used, stored, or incorrectly disposed. Even though the labels may not clearly state that the product contains an organic solvent, they do give indicators such as the terms FLAMMABLE, COMBUSTIBLE or CONTAINS PETROLEUM DISTILLATES. Solvents may have a distinct odor. If your product meets one or more of the following criteria, it may contain an organic solvent. To reduce household hazardous waste, start with prevention. Buy the most appropriate product for the job and the least hazardous product -- use alternative less hazardous products. Check to see if you already have the product on hand before buying more. Ask if a neighbor has some of the leftover product you can use up. Where appropriate, use water-based rather than organic solvent-based adhesives, cleaners, paints, finishes, etc. Caution or warning usually imply less hazard than danger or poison on the product label. Use mechanical devices if possible such as drain plunger or plumber's snake when appropriate for the job. Completely use up the solvent or share it with others to use if safe to do so. Household hazardous waste collections in a limited number of communities are held to specifically manage household hazardous products. If it is not possible to take the product to a household hazardous waste collection site or to completely use up the solvent and only small quantities remain (quantities so small as to be unusable), it may be evaporated. Evaporate the solvent in small quantities allowing the residue, if any, to harden for disposal either at a hazardous waste collection or permitted sanitary landfill if accepted. Do not burn the hardened residue as the residue may give off toxic fumes, leave a toxic residue or be dangerous to burn. If the solvent is in an aerosol form, use up or give away for others to use up. Place the empty container in the trash for disposal in a permitted sanitary landfill. Be very careful of potential combustion and do not breath the vapors. Move the container to a secure, sheltered outdoor area away from spark sources or flames, children and pets. Open the lid and allow liquid to dry. Discard hardened residue at household hazardous waste collection or in trash if permissible by transfer station or landfill. Solvents flushed in a community waste water treatment system or a home septic system may interfere with the normal biodegradation process. Toxic solvents can pass through the system unchanged to be discharged directly into the drainfield soil and might move back into well water. Septic systems can only partially treat chemical wastes. Technically, most household waste is exempt under RCRA hazardous waste regulations. However, householders should manage potentially hazardous household waste responsibly. Andrews, E. (1989) Paint andOther Home Improvement Products. (G3554) Madison, WI: University ofWisconsin-Extension. Lund, H. (1993). TheMcGraw-Hill recycling handbook. NY: McGraw-Hill. Proceedings of the NationalEPA Conference on Household Hazardous Waste (1990,1991,1992,1993,1994). AndoverMA: Dana Duxbury & Associates. Disposal Do it Right.Household Products Disposal Council. IF NOT PROPERLY USED, PAINT STRIPPERS ARE HAZARDOUS TO YOURHEALTH AND SAFETY. Paint strippers contain chemicals that loosen paint fromsurfaces. These chemicals can harm you if not used properly. Some paint stripping chemicals can irritate the skin and eyes, orcause headaches, drowsiness, nausea, dizziness, or loss ofcoordination. Some may cause cancer, reproductive problems, ordamage of the liver, kidney, or brain. Others catch fire easily.Proper handling and use of paint strippers will reduce yourexposure to these chemicals and lessen your health risk. Most paint strippers are solvent-based. Solvents dissolvethe bond between wood and paint. Solvents also can dissolveother materials, including the latex or rubber of commonhousehold or dish washing gloves. Some solvents will irritate orburn the skin. Some solvents may cause serious health effectseven if contact does not immediately cause pain. In addition,many solvents evaporate quickly and you can easily inhale them. Inhalation of these solvents can produce health effectsimmediately or years after exposure. It is especially important to use paint strippers containingsolvents that evaporate quickly either outdoors or in an indoorarea with strong fresh air movement. Some paint stripperscontain solvents that do not evaporate quickly. When using thesestrippers indoors, be sure to open windows and doors to providefresh air movement in and out of the work site. You shouldalways follow the manufacturer's instructions and safetyprecautions. Use the amount of stripper recommended by themanufacturer to avoid buildup of harmful fumes. Methylene chloride is the most commonly used chemical inpaint strippers. Methylene chloride products come in twovarieties. One type is nonflammable, while the other type isflammable. The flammable paint strippers have less methylenechloride but have other flammable chemicals, including acetone,toluene, or methanol. Methylene chloride causes cancer in laboratory animals. TheU.S. Environmental Protection Agency (EPA) and the U.S. ConsumerProduct Safety Commission (CPSC) consider the chemical to be apotential cause of cancer in humans. Methylene chlorideevaporates quickly, and you can inhale it easily. Breathing highlevels of methylene chloride over short periods can irritate theeyes, skin, nose, and lungs. It can also cause dizziness,headache, and lack of coordination. Your body changes someinhaled methylene chloride to carbon monoxide. Carbon monoxidelowers the blood's ability to carry oxygen. This can causeproblems for people with heart, lung, or blood diseases who usemethylene chloride paint strippers indoors without fresh aircross-ventilation. High exposures to methylene chloride for longperiods can also cause liver and kidney damage. It is very important to reduce your exposure to methylenechloride vapors. It is very important to have a lot of fresh air whenusing methylene chloride products. Use methylene chloride paint strippers outdoors ifpossible. If you must use them indoors, open all doors andwindows to ensure that the fresh air is moving in and out of theroom. For indoor use of nonflammable methylene chloridestrippers, also use a fan to keep fresh air moving throughout thework area. Electrical sparks from fans may increase the chanceof flammable paint strippers fumes to catch fire. The safest place to use flammable methylene chloridestrippers is outdoors away from any source of sparks, flame, orhigh heat. These chemicals are commonly used together. All threechemicals evaporate quickly and are very flammable. Breathinghigh levels of these chemicals can cause a variety of effects,including drowsiness, dizziness, and headache. Breathing highlevels of toluene may harm unborn children. Breathing very highlevels for a long period may cause brain damage. Toluene andmethanol are poisonous if swallowed. To avoid fire and health problems, it is very importantto use products containing these chemicals only in areas withplenty of fresh air. Do not work near an open flame, pilot lights, orelectrical sparks when using flammable paint strippers. Do notuse strippers near gas stoves, kerosene heaters, gas or electricwater heaters, gas or electric clothes dryers, gas or electricfurnaces, gas or electric space heaters, sanders, buffers, orother electric hand tools. Excessive contact with NMP may cause skin swelling,blistering, and burns. These skin reactions may not appear untilsome time after exposure. N-methylpyrrolidone can readily getinto the body through the skin and may cause health problems. NMP may cause reproductive problems and harm to unborn children. It is very important to wear chemical-resistant glovesand avoid skin contact when using this solvent. Wash hands immediately after use, even when wearinggloves. Avoid using this product for extended periods in anenclosed area without open doors or windows to the outside forcross-ventilation. Much less is known about the possible health effects ofthese chemicals than about most of the other paint strippingchemicals. Some people using DBE products without fresh air havereported temporary blurred vision. Repeatedly breathing DBEdamages the cells lining the nose of laboratory animals. Somestrippers include a mixture of DBE products and NMP. Use appropriate protective clothing and provide fresh airto the work site when using these products. Caustic alkalis react with the paint coating and loosen itfrom the surface. One of the chemicals in this type of stripperis sodium hydroxide (lye). Some people do not use causticalkalis because caustic products can darken wood and raise thegrain. Caustics can cause severe burns to skin and eyes even onshort contact. Therefore, be very careful to keep causticchemicals away from skin and eyes and wear protective clothing. If contact occurs, wash off immediately with cold water. Caustics are also highly toxic if swallowed. It is very important to avoid skin and eye contact whenusing caustic alkalis. Use gloves that fit properly and are appropriate forcaustic alkalis. Wear appropriate protective clothing and goggles whenusing caustic alkalis. Some paint strippers have a citrus smell or make"environmentally friendly" claims. However, these paintstrippers may be hazardous despite the smell and environmentalclaims. It is important to use appropriate protective clothingand fresh air for cross-ventilation when using these products. For more information about household solvents and hundreds of other potentially hazardous household products check our Extensive Household Chemical Encyclopedia which convers over 100 household hazardous chemicals, many of which are also solvent-based. Guide to Paint Related Products will explain why paint (a common source of household solvents) is one of the most dangerous sources of toxic household chemicals. Learn how to use, store, and dispose of paint and paint-related products safely. Household Product Safety Guide has tips for the safe use, storage, and disposal of household products found throughout your home. Guide to Hazardous Substances will give you more safety information about common household products and the toxic chemicals they contain. Asbestos Guide with Material Safety Data Sheet Information is an extensive guide to every aspect of asbestos health hazards, exposure risks, abatement resources and tips, answers to common questions, and toxicological information. Radon Gas Guide is not to be missed especially if you are a smoker. We all need to have our homes tested for Radon no matter where we live. You're probably breathing this deadly radioactive gas into your lungs right now! Question is, how much? Our Radon guide will help you answer that question and many more. Benzene Guide with Material Safety Data Sheet Information for this deadly household solvent is an extensive collection of health and toxicological information about Benzene, including practical answers to common questions about this Leukemia causing volatile organic compound. Formaldehyde Guide with Material Safety Data Sheet Information will explain the how, where, when, and why of one of the most common volatile organic chemicals contaminating your indoor air. Acetone Guide with Material Safety Data Sheet Information is an extensive source of information about one of the most common organic solvents associated with paint use and disposal. Mercury Guide with Material Safety Data Sheet Information will answer every possible question you could have about one of the most serious public health hazards affecting societies today. Mercury is likely detectable in your blood - learn why, and what the resultant health affects of our body burden of Mercury might be. Lead Guide with Material Safety Data Sheet Information is an extensive guide to Lead which answers to every possible question about Lead and why it's also one of the most serious public health hazards affecting children and families today. Lead in water and Lead based paint is of particular concern to children and pregnant women; but it's found in all our bloodstreams, learn why and how to reduce exposure to Lead.